A Webinar's success is determined well before the event starts. That's why Webinar producers need a strategic roadmap for creating and managing Webinars that deliver the greatest ROI. 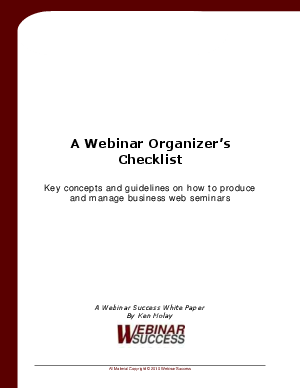 This Webinar Success white paper provides guidelines on how to produce and manage successful Webinars – from the first (and most important) step of defining purpose and expectations to quantifying results after the event.